With Vietnam looking to renewable energy sources to meet the country’s power generation needs, ABB was selected as a key partner for providing solar products and solutions across more than 20 projects. Although hydro and thermal are currently the two largest power sources of Vietnam, both are facing challenges to meet increased demand. Hydro power is almost fully exploited while coal-fired thermal power plants are facing increasing opposition due to their environmental impact. New power generation is therefore increasingly vital to fuel continued economic growth and to address the country’s sustainability commitments. Vietnam is transitioning to renewable energy sources to maintain competitive electricity generation and to deliver increased capacity quickly. Among renewable energy sources, solar energy in Vietnam has been making great strides in the last 12 months. ABB has provided products and solutions to help deliver generation and grid connections for over 2 GW in more than 20 solar projects in Vietnam. 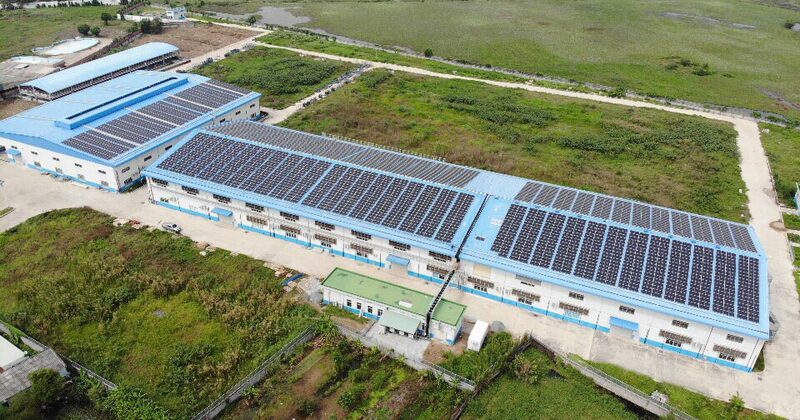 The projects range in size from a 75 kWp solar power installation at ABB's factory in Bac Ninh to utility scale solar farms across the country. “Vietnam is at an exciting phase of its development. The decisions and investment made now and in the following few years for solar generation, storage, transmission and distribution will have long lasting implications for future generations. ABB, with project experience in several Giga Watts of solar generation globally and the mix of global knowledge and local experience, will support realizing the government’s ambition for a sustainable energy ecosystem.” said Brian Hull, Country Managing Director of ABB in Vietnam. A solid track record in the solar industry since the 1990s and expertise in solar energy from grid connection and integration to smart grids and microgrids, globally and in South East Asia in particular, have given confidence to investors and developers to use ABB’s technology. In Vietnam, ABB has a well-established presence in various economic sectors and in the power business in particular. Orders placed to ABB in solar energy include full electrical balance of plant (eBoP) and SCADA systems, 220kV and 110kV grid substations, inverters and medium voltage switchgear. Supplied full electrical balance of plant (eBoP) solution covers all equipment selection and engineering design aspects from the DC output of the solar panels to the connection and the grid transmission network. Latest ABB AbilityTM SCADA technology is also incorporated to ensure optimal generating efficiency with all OEM equipment designed to maximize reliability and load losses, thus ensuring maximum return for investors. For utility-scale applications, ABB’s leading central inverter, the PVS980 provides the ideal solution. Equipped with a highly efficient and maintenance free, self-contained thermosiphon principle based liquid free cooling system, it has been chosen by many investors to ensure optimal performance for up to 25 years regardless of how extreme the climate conditions are. A dedicated local expert service team also helps ensure smooth installation, commissioning and grid connection and responds to any issues during the lifetime of the project. For rooftop projects, ABB’s three-phase solar string inverters, plus ABB Weather Station (VNS800) and an ABB smart ACB Ekip, technologies, that assure optimal performance with high automation while ensuring cost and space savings, have been widely used in the country. Timely delivery is one of the factors that investors take into account for the execution of their project, with the current FIT due in June 2019. With its manufacturing facilities in Vietnam currently serving local customers and exporting to more than 60 countries worldwide, ABB’s local manufacturing footprint enables them to meet all requirements. ABB has supplied power transformers and high efficiency inverter transformers manufactured by its factories in Hanoi to help developers minimize installation time on site. ABB has also developed skids solutions containing inverters and MV switchgears delivered by ABB’s factory in BacNinh. While maintaining ABB’s top standards in quality and safety, local manufacturing allows faster delivery and lowers the customer’s cost base. For the next phase of industrial development, ABB is ready to provide a range of battery storage solutions to help ensure solar power generation continues to develop without putting unnecessary stress on the grid. ABB sees energy storage solutions as key part of the future grid in order to efficiently utilize renewable energy. ABB started its operations in Vietnam in 1993. In the 25 years since, it has grown to be a reliable partner in the field of technology, providing turnkey solutions and services in the market. ABB recently co-hosted a dialogue with the Electricity and Renewable Energy Authority under the Vietnam Ministry of Industry and Trade (MOIT) on renewable energy. Attended by representatives from across the power industry, the seminar titled “Renewable energy integration: challenges and technologies” addressed the future for clean energy in Vietnam. The company has also been actively participating in the formulation of the Direct Power Purchase Agreement to support Vietnam’s transition to increase the generation and consumption of renewable energy.